Alyson and Michael Jones made their first visit to Jackson, Wyoming, during Christmas 2012. “It was calling us all along,” says Alyson. “Wyoming was kind of like the North American version of the African safari—all these big animals roaming wild,” says Michael, a native of Ottawa, Canada. 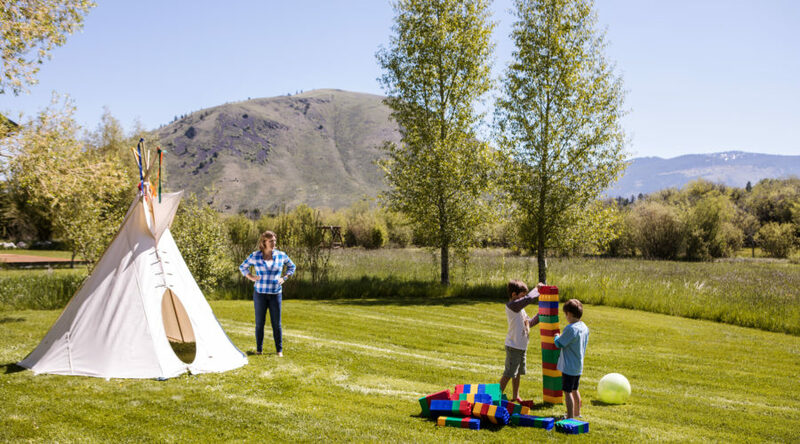 “After we saw the kids [Casey, now 5, and Dylan, 7] responding to it the way we did, it was a done deal,” says Alyson. So when they found a 2,400-square-foot, split-level home on an expansive lot bordered by a bubbling creek near national parkland, they pounced. 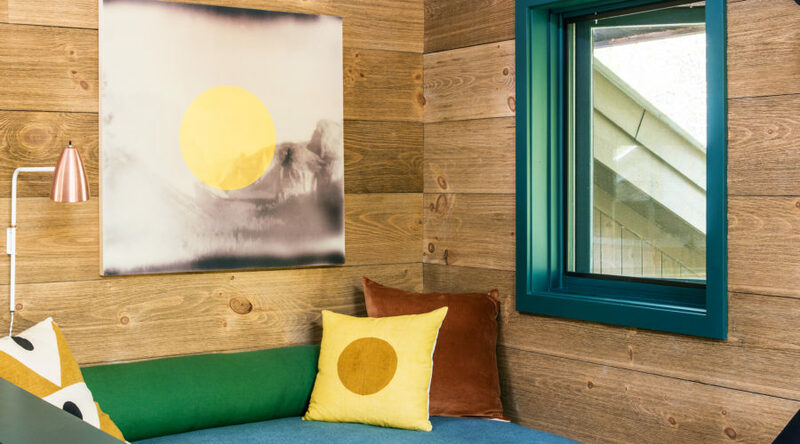 Enter Frances Merrill of Reath Design, a friend of Alyson’s since high school who had also redesigned the family’s Santa Monica abode. “The second Fran got to the house, she said, ‘We need to make the inside as good as the outside,’” Alyson remembers. The designer’s first priority was to transform the back of the building with the addition of a deck, a big triangular window, and French doors. 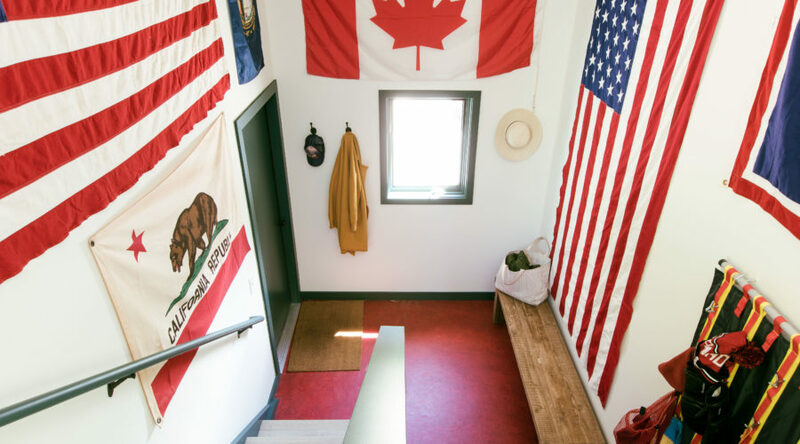 She opened up the floor plan, removing a wall that divided the living room from the kitchen and expanding an adjacent doorway from the mudroom. 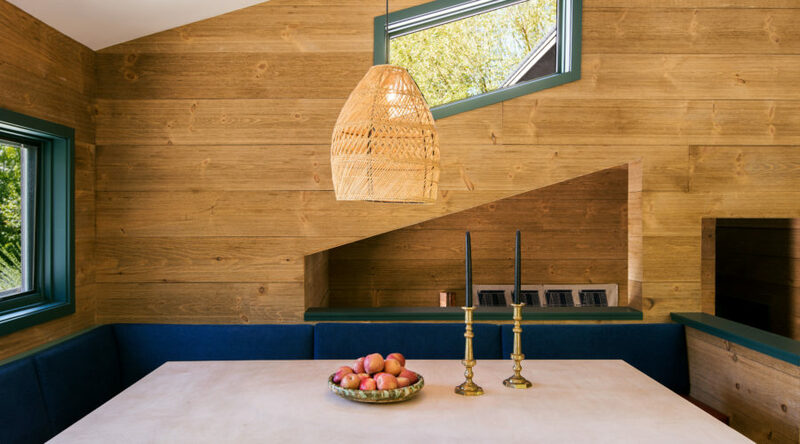 Merrill and her project manager, Zeb Knudsen, a native of Jackson Hole, also added wood paneling throughout to set a warm, cohesive tone that resonates with the structure. 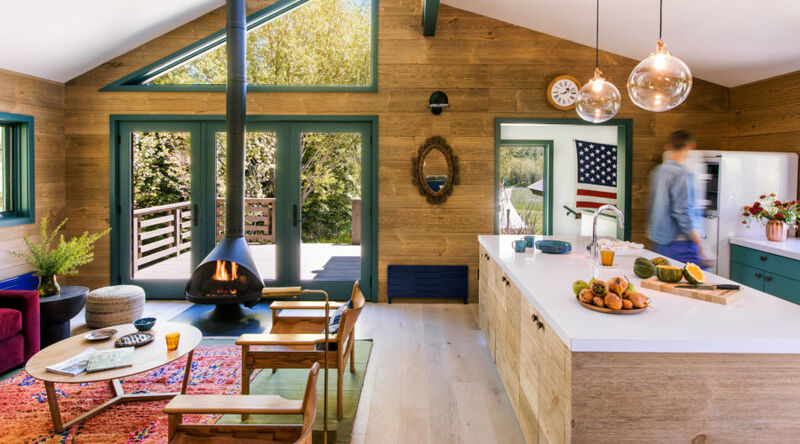 The heart of the house is the open-concept kitchen and living room, with views of the sprawling backyard landscape. The space hinges on an oversize custom dining table and banquette. It’s here that the family christened their first stay in the house, with a New Year’s Eve meal of hot dogs and homemade baked beans. After dinner came a pajama-clad ride in their truck to watch the annual fireworks show and torchlight parade. “We custom-made this giant table so they can seat a lot of people if they pack the house for a holiday. But it’s also a nice corner to work alone at with your computer,” says designer Frances Merrill. 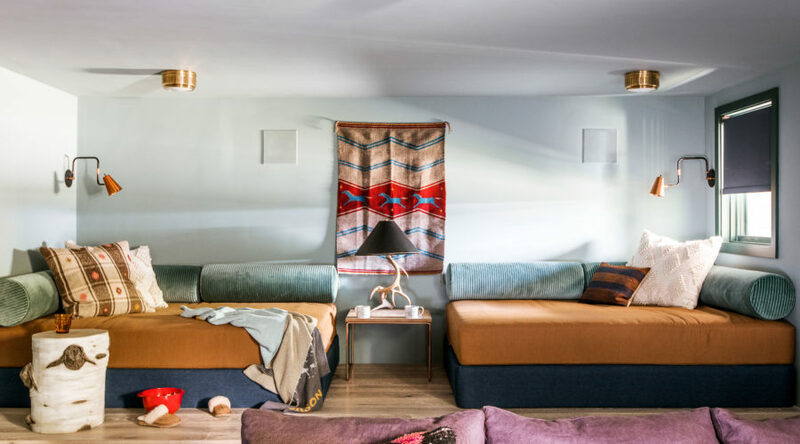 Denim-back cushions and Naugahyde seats add functionality, while simple decorative touches include the owners’ vintage candlesticks and a ceramic bowl. 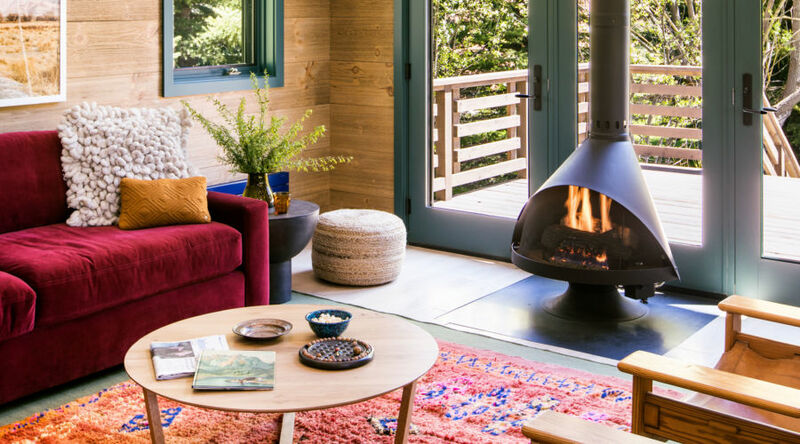 Merrill reworked the back of the house completely, transforming the far wall into a network of glass windows and doors that connect to the deck and also installing a Malm fireplace as a focal point for the seating area. To maximize the amount of open space, Merrill took down a wall between the kitchen and dining room and installed light-colored wood flooring “so the overall look wouldn’t be too retro.” Her priorities for the kitchen were to stay simple: “The big white island keeps everything bright and clean.” Windows are trimmed in Benjamin Moore’s Tarrytown Green, used repeatedly as part of a sophisticated spin on a traditional winter palette. Cabinetry paint in Waterbury Green HC-136; white paint throughout in White Dove OC-17. From $43/gallon; . a fun personalized feeling to the space,” says owner Alyson Jones. “I also like the ritual of taking your muddy shoes or snow pants off in a lovely environment, then having a nice place to organize everything.” GearStash wall organizer, from $147; . in unlacquered copper to play off the wood paneling she added to the entry. A one-of-a-kind wall hanging and a bench upholstered in vintage rugs supply subtle texture and color. Ada Sconce 9, from $495; . 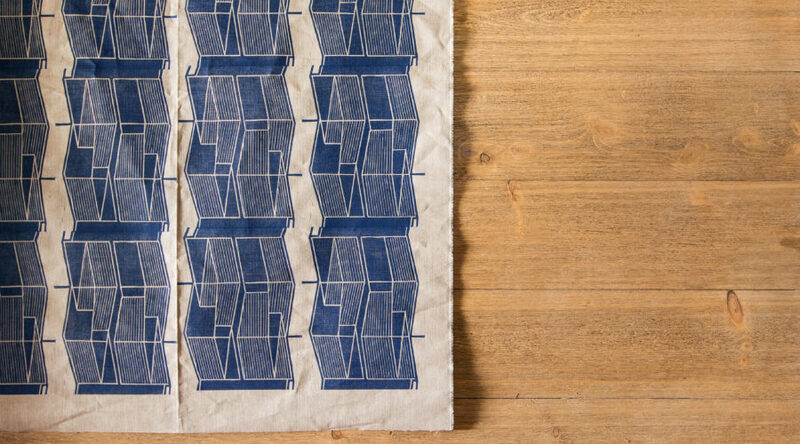 Rockfalls wall hanging by Elise Ferguson, $850; . In a corner of the living room, upholstered mattresses are stacked and paired with a bolster and graphic throw pillows. An artwork by Ryan Snow hangs above. Marigold Pillow, $70; Signal Pillow, $85; . The Joneses wanted a flexible sleeping setup, so a long headboard upholstered in striped fabric by Rose Cummings runs the full length of the wall, adapting easily to either two twin beds or a king. “We had the family collect stickers from all over Jackson to put on the Ikea nightstands—there’s something so ski-town about that,” says Merrill. Circle of Life Blanket, $249; . 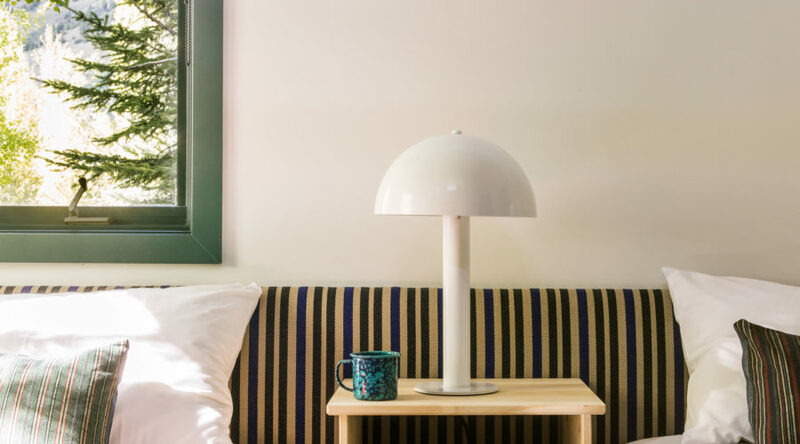 Sidnie Lamp in white, $299; . 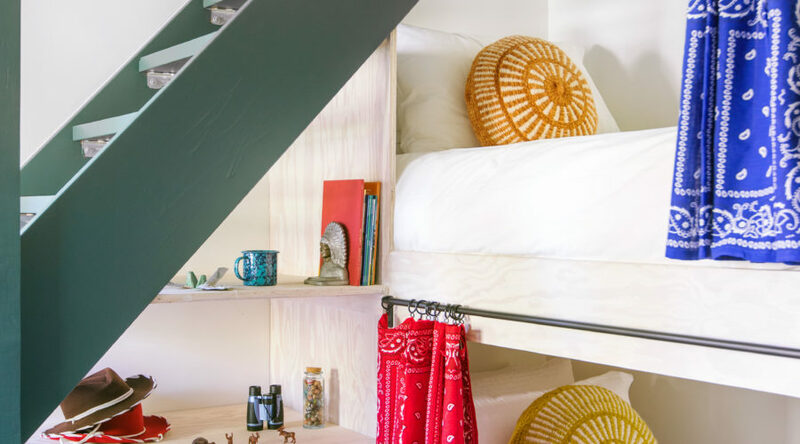 I don’t know how, but now the room feels bigger.” The designer instructed the project’s contractor to make the bunk bed look handmade and not too fancy—"like a bunch of ski bums built it themselves." She added custom handkerchief curtains for privacy. “Left to her own devices, Alyson would have had antlers everywhere,” says Merrill with affection. 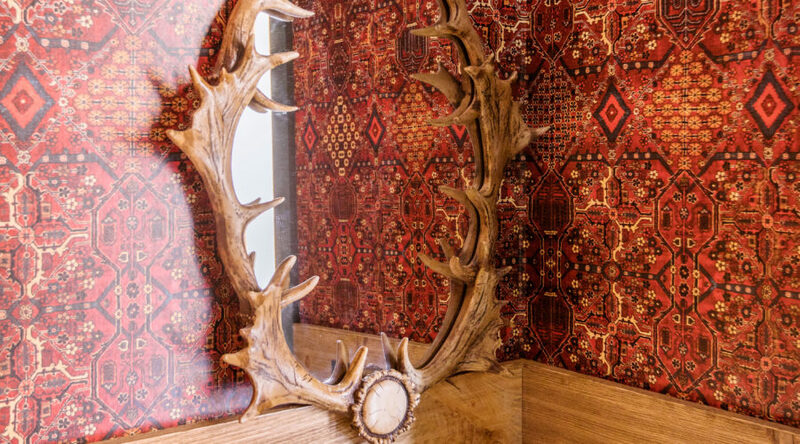 “But it was always about making a mountain home that is modern and warm and doesn’t hit a theme-park vibe.” In the powder room, a horned mirror from eBay hangs over wallpaper from House of Hackney, with a sconce providing an industrial note for contrast. 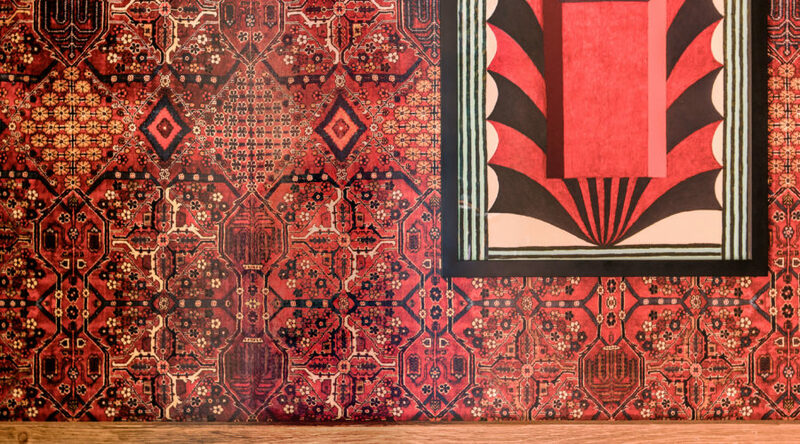 Mey Meh Wallpaper in red, $246/roll; . The Bowie Wall Sconce in Barn Red, from $97; . The original master bath had a massive tub and enclosed shower stall. “Putting in a freestanding tub and a glass shower did a lot,” says Merrill. 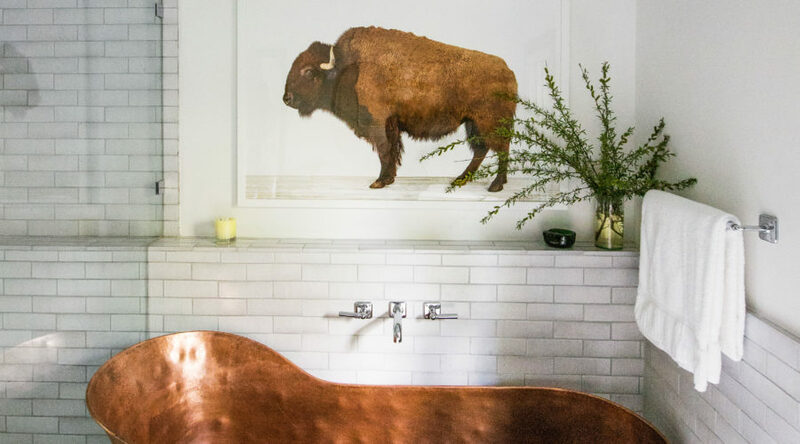 “But there was something I loved about adding the white glazed brick too—it felt right for the vibe.” Henrick Textured Copper Slipper Tub, $1,999; . American Buffalo print, from $25; . In this downstairs den, Merrill built a raised level to create stadium seating. A vintage wall hanging sourced on eBay makes for a focal point on the mint green wall; an antler lamp from Etsy and an imitation aspen-stump stool are small riffs on the rustic theme. Hardwired Double-Jointed Lamp, from $235; . Paint in Oval Room Blue No. 85, from $110/gallon; .